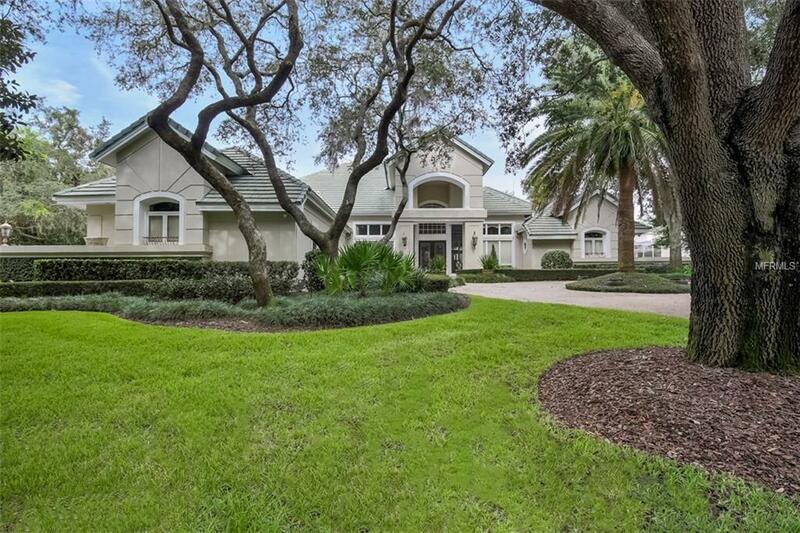 CYPRESS POINT IS ONE OF CENTRAL FLORIDAS BEST KEPT SECRETS WITH THE EXCLUSIVITY OF COMMUNITIES LIKE ISLEWORTH BUT WITH THE INTIMATE FEEL OF A BOUTIQUE COMMUNITY NESTLED AMIDST THE SHORES OF THE BUTLER CHAIN OF LAKES. AS A GUARD GATED NEIGHBORHOOD AND WITH A VERY ACTIVE ASSOCIATION, TOGETHER THEY HELP CREATE AN UNPARALLELED FEEL OF LUXURY. THIS RESIDENCE WAS COMPLETELY REBUILT AND ELEGANTLY DESIGNED IN RECENT YEARS. A BRIGHT OPEN CONCEPT WITH RICH HARDWOODS EMBRACE YOU UPON ENTRY FROM THE MITERED GLASS FOYER WALLS. DRAMATIC CUSTOM LIGHTING CATCHES YOUR EYE FROM EVERY DIRECTION. SOARING WINDOWS AND 14 FT CEILINGS CREATE A VOLUME FEEL THAT BRINGS THE LUSH LANDSCAPING FROM OUTSIDE, INWARD, CREATING A NATURAL TRANSITION. ELEGANT FORMAL DINING AND FORMAL LIVING ACCENTED WITH VENETIAN PLASTER CEILING DETAILS. A RICH DEN/STUDY OFFERS EXTENSIVE BUILT INS AND ACCESS TO AN ADJACENT FULL BATH. THE MASTER RETREAT EMBRACES YOU WITH THE ELEGANT DESIGNER DETAILS AND IS QUITE SPACIOUS AT 26X17 AND HAS DIRECT ACCESS TO REAR LANAI AND POOL. ELEGANT MASTER BATH WTIH WALK IN SHOWER, DUAL VANITIES AND WALK IN COMMODE ROOM WITH BIDET. GOURMET KITCHEN WAS COMPLETED UPDATED WITH SOLID WOOD CABINETS, 6CM EXOTIC GRANITE COUNTERTOPS AND LUXURY STAINLESS APPLIANCES.EXTENSIVE CUSTOM CORNICE BOARDS AND DRAPERIES THROUGHOUT THE HOME AS WELL AS BLINDS FOR PRIVACY IN MOST WINDOWS. TRAVERTINE MARBLE DECKING ON ENTIRE SCREENED REAR LANAI WITH TROPICAL WATERFALL INTO THE POOL AND HEATED SPA.